for at-risk, ESL, and struggling readers. 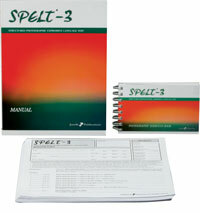 The SPELT3 is designed to help speech-language pathologists elicit specific morphological and syntactic speech structures that may not occur in spontaneous language samples. 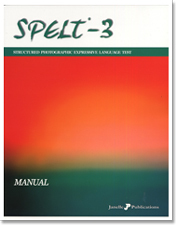 Using 54 full-color photographs, test items explore use of prepositions, plurals, possessives, tenses, and other morphological structures, plus such elements of syntax as negatives, conjoined sentences, interrogative reversals, and front embedded clauses. Administration takes 15-20 minutes. Standard scores, confidence intervals, percentile ranks and bands, and age equivalents are provided.